No-cook jam means no hassle, no fuss and no problem! 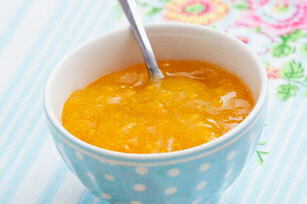 Our CERTO No-Cook Peach & Apricot Jam recipe is easier than you think. STIR together prepared fruit and sugar, mix well and let stand for 10 minutes. STIR in fruit pectin and lemon juice. Continue to stir for 3 mintues until most of the sugar is dissolved. POUR into clean jars or plastic containers. Let stand at room temperature until set (may take up to 24 hours). Store in freezer, or if used within 3 weeks jam may be stored in refrigerator. Ready In time does not include set time.